Super Lucia Tuttolente Petrol Need Help? Weighing in at less than 1oz, TUTTOLENTE(Literally meaning “ALL LENS") is the first ever series of completely frameless sunglasses. A RetrosuperFUTURE design that puts emphasis on the future. In an elegant execution, each frame is made of just a single sheet of lightweight Zeiss lenses, comprising both the front and arms. Finished with 3 barrel hinges and light weight minimal nose pads affixed directly to the lenses, add durability and comfort. 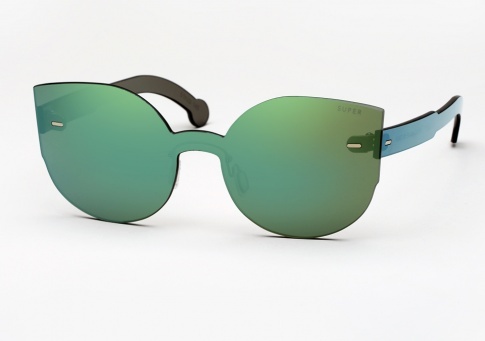 It is offered here in Super's signature Lucia shape, with unique petrol green mirrored lenses by Zeiss.